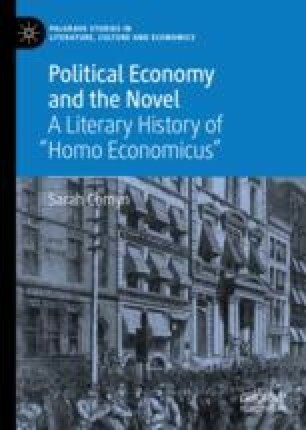 Focusing on Pip’s necessary traversal of the margins of homo economicus’ environment, Comyn examines the manner in which Great Expectations (1861) foregrounds and complicates many of the moral and social dimensions the economist John Stuart Mill attempts to exile from political economy’s concerns. Simultaneously, however, this chapter rescues Mill from the easy demonisation that his abstract model of political economy has afforded him. Instead, this chapter demonstrates the complex imbrication of moral and amoral domains that both Dickens and Mill attempt to confront but are never able completely to resolve or stabilise. This chapter shows how Pip is ultimately redeemed by his empathic imagination.